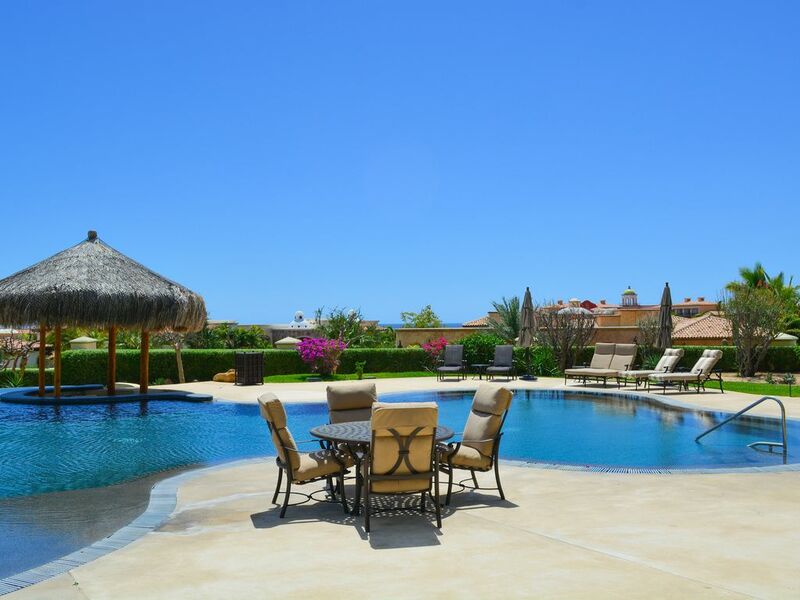 'Casa Bella' (Spanish for beautiful home) is an exquisitely appointed 2,690 square-foot retreat at the prestigious Puerta Del Sol private resort in Cabo Del Sol. Your terrace has spectacular sunset and ocean views over the sparkling Sea of Cortez. Views extend over the eighth hole of the famous Jack Nicklaus Ocean Course, to the mountains on the right and a picturesque lighthouse and sea on the left. Located off the 'Tourist Corridor,' a 20-mile stretch of stunning beaches connecting Cabo San Lucas and San Jose, this spacious retreat is quiet and relaxing, yet close to everything. You are just a 7-minute drive from downtown Cabo and a few minutes’ walk from the often deserted white sand beach and fine dining at 2 adjacent resorts. This is a quiet, double gated community with 24-hr security. The professionally designed interior has custom Mexican furniture in each room, accessorized with beautiful pottery and artwork. A dramatic entrance features a marble sun floor surrounded by hand laid rocks – a masterpiece of Mexican craftsmanship. A beautiful open floor plan invites warm ocean breezes while the overstuffed furniture invites you to sink in and relax. The glass wall in the great room slides open to a large private terrace with ocean views - perfect for a sun-kissed brunch, an afternoon siesta, or a sunset margarita! The large entertaining kitchen is open to the great room and terrace views. A marble eating counter with swivel Mexican bar stools offers optional seating. The kitchen is fully equipped with utensils, appliances, and dishes including hand-blown Mexican margarita glasses! The adjacent dining room seats eight under a beautiful Mexican iron chandelier as a focal point. Custom features throughout the condo include cantera stone accents, carved woods and marble, mahogany doors, and beds with quality mattresses…this is a Mexican luxury experience. From the terrace you can see the hacienda-style golf clubhouse at the famed Cabo del Sol Golf Course. Non-golfers are welcome to enjoy the 40,000 square foot facility, and shop at the large golf boutique and dine at the restaurant and bar. A fantastic buffet brunch is offered Sunday mornings, or enjoy a cool afternoon drink or a romantic dinner outside on the patio. Come to Casa Bella - and realize, maybe for the first time, what true relaxation is. This luxury condominium resort is in a dual-gated 10-acre community on a 1.5 mile secluded walking beach and prime coastline. Condos are privately owned and only some are offered for rent, so the resort is quiet and rarely full. Guests have plenty of space to relax and chill out. Often there are no more than 5 people on our beach - very unique. The resort is situated between the Sheraton Hacienda del Mar and Fiesta Americana in the Cabo del Sol 1,800-acre recreational community. Casa Bella guests are welcomed at the neighboring restaurants, and you can easily walk over on the sand for outdoor dining and drinks. Choose from world-class cuisine to tacos and burgers. We recommend the casual all you can eat breakfast at Girasoles roof top restaurant and cantina at the Sheraton. On Sunday the Cabo del Sol golf course clubhouse offers a fabulous buffet brunch. For a sunset dinner cruise, world class big game fishing, or shopping and party bars, the Cabo marina and downtown are a 7-minute drive. Grocery stores and ATM within 5 minutes. Casa Bella is a beautiful place to get away and relax without crowds. Ocean, mountain and sunset views. Location, seclusion, size and beauty. Casa Bella rooms are large, totaling 2,690 square feet, including a 290 square foot terrace where sunsets are a nightly event. The professionally decorated Mexican interior was designed for all around comfort. High quality mattresses were carefully selected and bedrooms have blackout drapes to ensure restful sleep so you can fully recharge on vacation. The great room has floor to ceiling windows that slide open 15 feet, to the 33-foot long terrace. Here you will be grilling and dining, reading, maybe whale watching, and celebrating sundown every night. Outdoor amenities include 3 pools and whirlpools, white sand between your toes in 5 minutes, and beautifully manicured grounds. Excellent and reasonably priced restaurants are within walking distance. Free Wi-F and a landline phone with free long distance is included. Cool underground parking in reserved space is free (self-park). All windows have screens to protect against airborne allergens and mosquitos. Come to Casa Bella and realize the true meaning of relaxation. All 3 bathrooms have 5-way adjustable shower flow, colorful hand-painted Mexican tile. Bath towels and pool towels are provided. Hair dryer in each bathroom. Includes body wash, bar soap, shampoo and conditioner. Puerta del Sol is a private resort, not a time share. Each unit is privately owned, and that is why it is so quiet and peaceful. Most are not rentals, so the resort is rarely full. Overlooking the 8th fairway of the Cabo del Sol Ocean Course, a masterful Jack Nicklaus design. From the terrace the Sierra de la Laguna Mountains are to the right, and ocean views are to the left. From the terrace you can spot whales (Dec - March), boats and occasionally flying Manta rays! 5 minute walk to the sand - exit through the ocean facing iron gate and follow short footpath to sand. Land line phone has a local number. Separate controls in each room. Washing detergent provided. Space to hang clothes in laundry room. Private underground parking in assigned spot. Self-parking only. Free assigned parking space in secure underground garage, just steps to the elevator. Bath towels, hand towels, wash cloths, kitchen towels and pool towels. Complimentary for guests. Located onsite at Palapa clubhouse. Treadmill, elliptical, bicycle, rowing machine & weights. Cable TV & desert view. Separate men's and women's steam room and sauna. 10 steps from private underground assigned parking spot. Filtered water and automatic ice made from filtered water. Built in oven plus a gas grill outside on the terrace. Hand painted Mexican dishes, service for 8. Silverware, steak knives, bakeware, pans, serving dishes and utensils. Hand blown Mexican stemware, placemats. Glasses, including unbreakable for the pool. Blender, serving dishes, and all the things needed to prepare great meals. Seating for 8 in the dining room. Outdoor dining table on the terrace seats 6 comfortably, and there is additional seating for 2. Flat screen Smart TV in great room and master bedroom, has Internet channels. 92 Sirius music channels included. Bluetooth compatible to play music from your mobile device. 3.5mm connecting cable also provided so you can play your own music through the stereo. Selection of paperbacks in hall cabinet. Large terrace has plenty of comfortable seating, gas grill and outdoor dining table for morning coffee, lunch or evening meals. No grab bars in bathrooms. 3-inch entry step in all 3 showers. Pathway to pool is wheelchair accessible. Separate sauna and steam room for ladies and men at the Palapa Clubhouse. Beautiful salt-filtered pool (not chlorine). Comfortable chaise lounge chairs and unbrellas for shade. Swim up Palapa bar is not stocked but you can make you own party. Pool hours 8am - 10 pm. Double gated Community with 24-hour security, Club House with Fitness Center, Steam Room and Sauna, Walk to Beach in minutes, fully equipped kitchen, including All-Clad Cookware, disposal, filtered water in refrigerator, all cooking utensils, linens, outdoor hot tubs (shared), 3 pools (shared), air conditioning with separate controls in each room, free underground assigned parking, free guest parking, smoke-free environment, handicapped access, free wireless DSL access, mid-week maid service included with 7-night rental, daily maid service available for additional charge, pre-arrival grocery stocking available (service charge), professional chef available. We were blown away by Marilyn's condo! The pictures honestly don't do it justice. The whole living room wall is a sliding glass door that opens to breathtaking views of the resort/ocean. We could even see whales from the balcony! I am so thrilled that we decided to rent this condo instead of going to a resort. By staying here and getting a rental car, we saw so much more of Cabo than we would have otherwise. The condo is very clean, very spacious, very comfortable. You can’t ask for more! Hoping we can stay here every year! Thank you, Marilyn! What an amazing place for our family and friends to hang out for the wedding of dreams. From the whale watching from the patio to the amazing indoor outdoor space. We couldn’t have asked for a better spot. Thank you so much for everything that was already there just as if you were at home. We will definitely rent again! So far the best place we’ve ever stayed. The condo is large, homey beautiful. The views absolutely amazing! Saw whales from the terrace every day... short walk to a very private beach every morning. Pools were amazing and we used them everyday. This place is private, quiet lovely... short drive to all the action if that’s what you need. I will be returning with girl friends soon. Marilyn ad wonderful to work with and extremely accommodating ! Best family vacation ever!! Spacious and luxurious with beautiful views. An amazing experience for our family of 5. We had everything we needed. This is the second time we’ve stayed here. It was beautiful!! I can’t think of a word that would describe this place except to say it’s fantastically awesome!! Marilyn is a dream to work with! So many things to do, I needed another 3 or 4 weeks to see and do. We watched whales every morning off the deck, beautiful sight! The condo is a dream, the kitchen is spacious and fun to cook in. Whether you relax and do a puzzle, read or lounge by the pool or hot tub, you can’t go wrong!!! Activities our guests enjoy include beach combing, whale watching, snorkeling, golf, swim with the dolphins, cruising, guided tours, zip lining, ATV, horseback riding, baby turtle release, walking the 1,800 acre Cabo del Sol resort community, and more! And of course Cabo San Lucas is known as the Marlin Capital of the world where you’ll experience some of the finest sport fishing year around. Guest Guide in the condo provides information on dining, beaches, activities and more. Please read "House Rules" in front of Guest Guide - thank you.